The presence of large numbers of global players and regional participants vying against one another for strong foothold makes the global clinical laboratory services market increasingly fragmented, finds Transparency Market Research (TMR). Several of these are focusing on bringing advancement in laboratory technologies, mainly by including advanced automation features. TMR notes that a growing number of providers in the global clinical laboratory services strive to offer better services to meet the current variety of end-user needs. Top players intend to get a competitive edge over their rivals by providing clinical laboratory services that can diagnose emerging threats of disease strains. Moreover, focus on capacity addition may be an integral part of robust strategy for players in the global clinical laboratory services market. Well-entrenched players in the global clinical laboratory services market include Sonic Healthcare, Eurofins Scientific, Laboratory Corporation of America Holdings, Fresenius Medical Care, and NeoGenomics Laboratories Inc.
Of the various types of tests offered, clinical chemistry presently holds the leading share in the global clinical laboratory services market. The segment is anticipated to clock a CAGR of over 6% during 2017–2025. The growth is fueled by rapid advancements in analytical techniques such as mass spectrometry and flow cytometry. Regionally, North America is presently dominant revenue contributor and is projected to garner an impressive CAGR during the assessment period. The growth is propelled by rising public and private investments in laboratory infrastructures in the region. 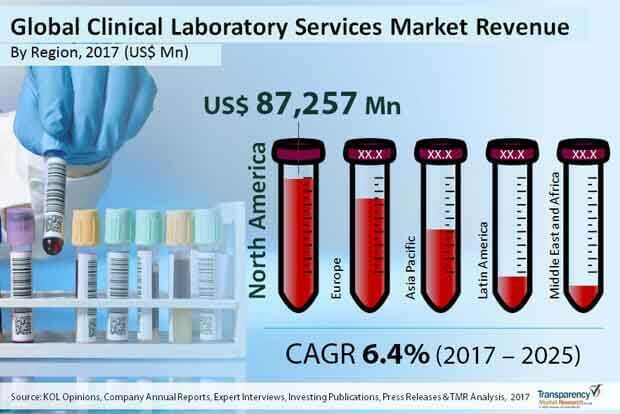 The global clinical laboratory services market is driven by the rising worldwide demand for better diagnostics for a variety of disease types, in order to guide therapeutic decisions for better healthcare outcomes. In various developing and developed nations, the rising demand for cutting-edge diagnostics for infectious and chronic diseases is bolster the growth in the clinical laboratory services market. These disease have grown in prevalence in numerous developing economies over the past few years. Moreover, the rising incidence of lifestyle-driven diseases in various parts of the world is propelling advances in the global clinical laboratory services market. In recent years, private laboratories have expanded their footprints, especially in developing countries, which has imparted a marked impetus to the market’s growth. To this end, even governments have increased their spending on laboratory infrastructure. The global clinical laboratory services market is witnessing new avenues by technological advances in lab testing. These advances notably pertain to the adoption of high-throughput assays. In addition, providers of clinical laboratory services are also developing customized assays to explore new streams of revenues in the market. Having said that, the global clinical laboratory services market also faces some setback. The unmet need of improved diagnostic devices in laboratories and the overall lack of clinical expertise in still developing nations hamper prospects. On the other hand, emerging threat of bioterrorism in global healthcare systems is a notable trend creating new, exciting opportunities in the global clinical laboratory services market. Moreover, clinical laboratory infrastructures in various developing regions are witnessing the wave of modernization. The rising awareness about the timely diagnosis of diseases, especially in a rapidly aging population, imparts a momentum to the demand for various clinical laboratory services. The growing application of high-throughput assays in drug development programs expands the potential of the global clinical laboratory services market. The study presented here is based on a report by Transparency Market Research (TMR) titled “Clinical Laboratory Services Market (Test Type - Clinical Chemistry, Medical Microbiology and Cytology, Food Intolerance Tests, Human and Tumor Genetics, and Other Esoteric Tests; Service Provider - Stand Alone Laboratories, Hospital based Laboratories, and Contract Research Organizations (CROs)) - Global Industry Analysis, Size, Share, Growth, Trends, and Forecast 2017–2025”.